We try to teach our kids manners, and we never quite know how that is going to work out. One day the Mom thought that the boy should have that down, so when someone gave him something, she waited to see what he would do. There was a silence and finally the boy turned to his mom, and said, Mommy, when someone gives me something, you are supposed to say, “What do you say?”! We can teach our kids to say please and thank you, but teaching them real gratitude is a whole different ball of yarn. It often takes time for the attitudes to catch up with the words, and sometimes they never do. We can teach someone to say “Thank you,” but it takes more to teach them to be gracious. We have two stories this morning about gratitude—specifically people who have a hard time being gracious. You may just think of Jonah as the guy who got eaten by a big fish. But there is much more to the story than that. He was sent on a mission—to go to Nineveh and tell them that God was very angry with them, and was about to destroy them. Of course Jonah did not want to go, so he got on a boat headed to Tarshish instead, which is the opposite direction. There was a storm, and Jonah realized it was a God-storm and not just an act of nature, so he was thrown off the boat, and swallowed by the fish. Apparently three days inside a big fish gives a man time to think about his priorities, and Jonah decided that going to Nineveh was now one of his priorities. So he goes there, and starts preaching to the people that God is going to destroy them. Well to his surprise and it turns out, his great consternation, the people received the message with open hearts. They repented. They changed their ways. And God decided that he did not need to destroy them anymore. Which is exactly what happened. God relented. God showed divine graciousness, divine mercy, and divine love. Jonah would rather die than live to see God’s love turned toward the Ninevites. If you remember last week, I mentioned anger, and how good anger can feel at times. Well, Jonah is someone who loves his anger. He loves nothing better than being angry—angry at the Ninevites and angry with God. After God decides to spare the Ninevites, Jonah goes up on a hillside, overlooking the city, hoping that maybe God will change the Divine mind, and he will get a front row seat to a great show of Divine wrath. But it is not to be. While he is sitting there, a plant grows up to give him shade from the hot sun. But then a bug comes along and eats the plant, causing it to die, causing Jonah to have to endure the hot sun. His response? “It is better for me to die than to live.” Oh, woe is me. Life is terrible! I’m hot and Nineveh is still standing! Better that I die than have to endure this! I can understand his anger at the Ninevites. Nineveh was the capital of Assyria, and Assyria was a perpetual threat to Israel. In the end, they did invade and essentially destroyed Israel, so the fear was well founded. But why was he angry with God? Jonah cannot be gracious for what he has, because all he can see is what he does not have. He cannot appreciate the joy of living, because he is too consumed with the work of complaining. Did the Ninevites deserve God’s compassion? Probably not. But did Jonah? No. He is a walking complaint center. Jonah was angry because his shade plant died. That’s the way life is, full of ups and downs. One moment we are basking in the shade, the next the sun is beating down on us. One moment everything seems to be going swimmingly well, the next it seems to have all fallen apart. How do we live in such a world? We learn to appreciate life when things are good, and that can help us get through those times when things are rotten. The good does not always outweigh the bad, but it can help us develop and attitude of gratitude, and THAT can help us. The second story is the parable of the vineyard. A man needs day labor for his vineyard, and so he goes to out and hires some workers. Later in the morning he realizes he needs some more, so he goes out and hires more workers. He still needs more, so later he hires more, and so on throughout the day. Finally, just a few hours before quitting time, he hires the last batch. They line up for their pay at the end of the day, and to everyone’s surprise, the people who came in at the very end of the day get a full day’s wages. Word gets out, and the folks who came in first in the morning are thinking they are really going to pull down a good day’s wages, but when it is their turn, they get the same thing as the people who just worked a few hours. And they sweated out in the hot sun all day long! So of course they let the vineyard owner know their displeasure, and the owners shows his displeasure with them. This is wrong! This is un-American! This is unjust! This is unfair! Now think about this for a moment, from the owner’s point of view. He could have just paid an hour’s wages for the people who worked an hour. That is what we are used to. We get what we earn. You work an hour, you get paid for an hour. You work a day, you get paid for a day. But this owner is different. He is thinking of things differently. Tell me, does milk cost less, if you were only able to get an hour’s wage? Is grain cheaper for the people who only an hour? Does anyone ever get an “I-could-only-find-a-few-hours-of-work-today” discount? Of course not. It costs just as much to feed your family on an hour’s wages as it does on a day’s wages. When asked why they were not working, the last people hired said they were waiting all day, but were not chosen. The owner of the vineyard is being compassionate. He found some people who have been waiting all day for work, and could not find any, and he wants them to be able to feed their families just the like the people he hired earlier in the day. He’s not thinking of fairness—he is thinking compassion. The people who worked early in the day, they want fairness…of course they want fairness because it works to their advantage. If he works one hour and gets ten dollars, and I work eight hours, then I should get eighty dollars. That is what is fair. Now here is what is interesting—they are angry, not because the owner cheated them, but because the owner was compassionate. They want equality. They want fairness. But the owner wants to show compassion. How often do we get caught up in looking at what other people get, as opposed to what we get? It’s an easy thing to do. It’s a game that is played a lot. Christmas rolls around, and you start eyeing the presents your siblings got, to see if they got more than you did. I know as a parent, I spend a lot of time trying to make sure that everyone gets an equal amount of Christmas booty. When we get a Christmas present from a friend, we want to make sure that what we give them is about as good. Now that kind of attitude does two things. First, it limits compassion. If we have to make sure they everyone gets equal amounts, or gets only what is fair in terms of what other people get, then we are limiting how much we can show love to others. We are not giving according to need, but according to a strict standard of fairness. 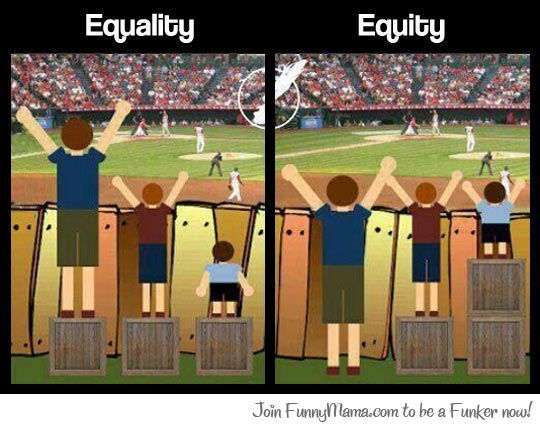 And sometimes fairness isn’t…well, fair. I read somewhere, equality is where everyone has shoes. Equity is where everyone has shoes that fit. We are not always called to be fair; we are called to be compassionate. We are called to reach out to people in need. We are called, not to make sure everyone has an equal share, or to make sure that people get what they deserve. We are called to give freely, without regard to strict standards, that limit our giving. We are called to give out of our abundance to people who stand in need. Now here is the other thing that happens when we over emphasize fairness—we limit our gratitude. If the standard for my gratitude is that I get roughly what you get, then it is going to be hard for me to maintain my gratitude, especially if you happen to get more. When I compare my blessings to the people around me, I lose sight of our important my blessings are for me. I might have been happy with my Christmas present until I saw that you happened to get a bigger present than I did. Maybe there is a reason. I remember one year my brother got a bike for Christmas, and I didn’t. I got nice gifts, but not a bike. Of course, my brother, who was younger, did not have a bike at that time, and I did, but still, he got a bigger present than me! I could have been happy with my G.I. Joes, or whatever it was I did that year, but I was too busy looking at what someone else got, and I lost my sense of gratitude. If we are focused on what we don’t have, we lose sight of those things we do have. And it is hard to be grateful people when all we see is what is NOT there. In my first church, it was a small congregation, about 80 people, and there were times when a lot of people might be gone the same Sunday. One Sunday, we had about ten people there. And I was upset. I was angry. I was angry at the people who weren’t there that Sunday. But during the service, and it was when the ushers were bringing the offering up, it was like a voice was speaking to me, saying, Murray, stop focusing on who is NOT here today, and focus on who is! Look at the faithful people who ARE here worshiping God, not at the people who are missing. And you know, after that, I stopped fretting over the people who were not there, and started serving the people who were. Is a preoccupation with fairness, with what other people have, keeping you from being grateful for those things you do have? Are you grateful for where you live, or do you keep seeing how other people live, and wish you had that? Are you grateful for your job, or do you see what other people are doing, and feel envious? Are you happy with the accomplishments of your children, or do you look at what other children have done, and wish yours had done more? The best way to make yourself happy is to learn to be grateful for what you do have, instead of focusing on what you don’t have. Sometimes our blessings are abundant—sometimes not so much. Sometimes we really should be content with what we have, other times it is ok to want more. But no matter what, if we lose sight of the blessings we do have, and lose a sense of gratitude for those blessings, we are in training to be miserable people. There was once a man who was walking down a mountain road. On one side of the mountain road was mountain, on the other side was a sheer cliff. He saw a lion coming down the path, and the lion looked hungry. There was a vine leading off the cliff, so the man climbed on the vine, and started to shimmy down. He looked down and saw a bear at the bottom, saying grace, waiting for him to come down. He looked over to the left side of the vine, and an army of ants were on the vine, chewing through it. He looked to the right, and saw a ripe strawberry. He plucked and ate it. That is living in the moment of gratitude. Our gratitude will probably not be that advanced, but we can practice it. For the next thirty days, I am taking the gratitude challenge, and I invite you to join me. Each day I will post on my FaceBook page three things that I am thankful for. In doing so I hope to build up my Gratitude Attitude. I want to challenge you to improve your Gratitude Attitude by also naming three things for which you are thankful, and telling someone what they are. You can post it on Facebook, or just tell a loved one or friend. Let us be the gracious people of God.